ASME problem sample manuals PTB-3 and PTB-4 are well kept secrets. The samples that used to be in the back of ASME VIII-1 in Appendix L have been changed, expanded and published as PTB-4. 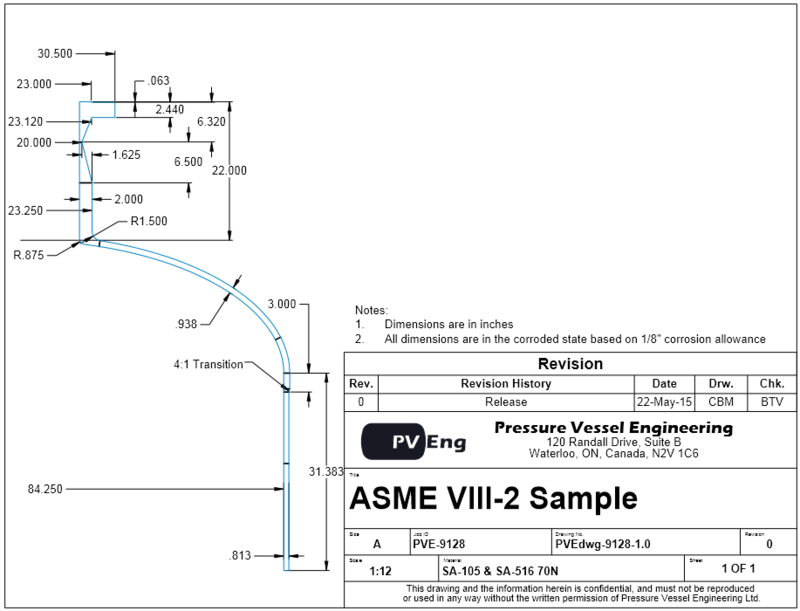 ASME VIII-2 was rewritten in 2007, and in 2010 it got its own new PTB-3 problem sample manual. PTB-3 contains examples with numerical results. Although meant more as an educational guide than a verification set, here we compare our own results in both ABAQUS and SolidWorks against published PTB-3 results. The sample vessel design used in PTB-3 sample E5.2.1. All dimensions are in the corroded state. We ran this sample through Abaqus and SolidWorks Simulation. PTB-3 example E5.2.1 “Elastic Stress Analysis” covers the correct use of stress linearization and provides numerical results. The same model is used for sample E5.3.2 “Elastic Analysis”. Here both are run. [From E5.2.1] Evaluate the vessel top head and shell region for compliance with respect to the elastic stress analysis criteria for plastic collapse provided in [VIII-2] paragraph 5.2.2. Do not include the standard flanges or NPS 6 piping in the assessment for compliance to allowable stresses. Internal pressure is the only load that is to be considered. Relevant design data and geometry are provided below and in Figures E5.2.1-1 and E5.2.1-2. Evaluate the vessel top head and shell region given in Example Problem E5.2.1 for compliance with respect to the elastic and elastic-plastic local failure criteria provided in [VIII-2] paragraphs 5.3.2 and 5.3.3. The same model and material conditions were used as in Example Problem E5.2.1. The pressure vessel head with nozzle as shown in PTB-3 sample E5.2.1 and also used for E5.3.2. The scope of analysis is limited to some of the shell, the head and the nozzle. The flange on the nozzle is modeled to allow loads to be applied, but is not included in the analysis. This example provides enough dimensional and material information to attempt to duplicate the results. Exactly matching the published results is not possible because not all model geometry is given and some linearization locations are not exactly provided. The 2D 8 node ABAQUS element type CAX8R was provided, however mesh sizes were missing. Where information exists, we replicated PTB-3 exactly. Where information is missing, we tried to get a model that looked similar to the one in the publication. Given these limitations, we hoped for results that match PTB-3 with less than 5% error. 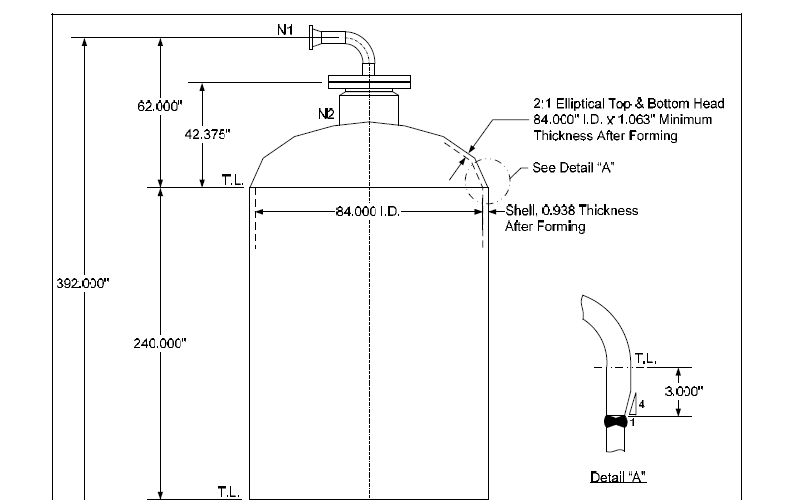 The scope of study in Examples E5.2.1 and E5.3.2 is the shell, head and nozzle. These are symmetric about the centerline allowing a 2D axisymmetric analysis to be chosen by the authors. This reduced the complexity of the analysis and allows a refined mesh to be used. Most model dimensions were provided in drawings E5.2.1-1 and -2. We re-created the 2D model geometry in SolidWorks. Where model dimensions were not available, we made our model visually match the published drawing. A link to a drawing of our model is provided in the resources section below. We used the same model in both ABAQUS – the software used by the authors and SolidWorks Simulation (SWS). We inferred the mesh size used by counting the number of elements in areas of known dimensions. We used this size of 0.015″ in both programs. The materials were modeled using the two different material moduli as outlined in PTB-3. The exact location of the change in modulus was not given, so we chose SCL #4 as the transition. PTB-3 figure E5.2.1-10. Location of Stress Classification Lines (SCL) 1 thorough 4. PTB-3 figure E5.2.1-11. Location of SCL 5 thorough 9. The exact location is not provided for 5 and 9. We split the model at Stress Classification Line (SCL) locations 1-9 as shown in the PTB-3 figures E5.2.1-10 and E5.2.1-11. The exact location was not provided for SCL 5 and SCL 9. We attempted to visually match the publication. We used exactly the same location in both SWS and ABAQUS even if we could not exactly match PTB-3. 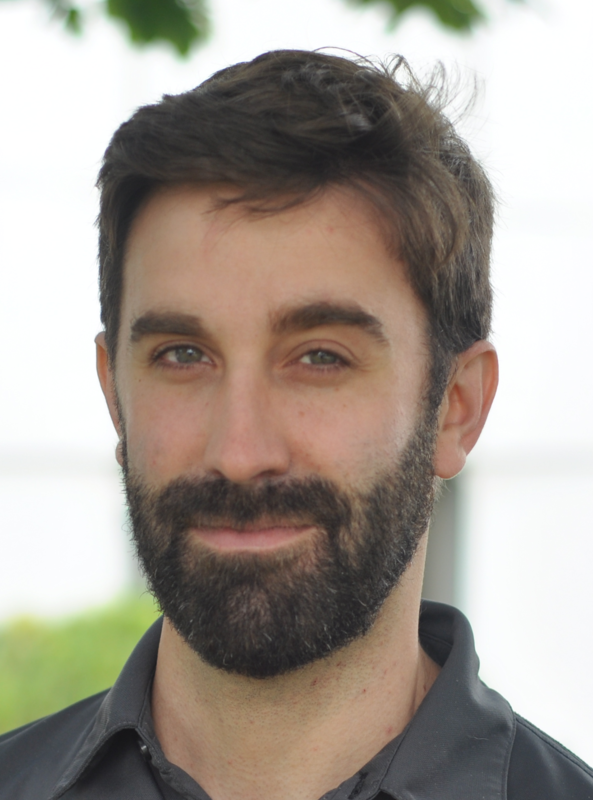 Two issues stand in the way of getting good SCL data. 1) taking a SCL at a bad location, and 2) setting up the tool poorly. Getting good SCL locations is not always possible. Our article “ASME VIII-2 Permissible Cycle Life” discusses what to do when a good SCL is not possible. PTB-3 does not discuss the reason for the 9 SCL locations chosen. VIII-2 Annex 5-A.3 discusses the selection of SCLs Because we often encounter results from improperly configured SCL tools some detail is provided here. The SCL starts with stress data taken from the model. The data set is taken on a straight line from the inside to the outside of the model. The data is rotated from global (or model) coordinates to local. When the SCL is on the X axis (like SCL #1 above) no rotation is required. The local direction 1-1 is the direction of the SCL. Stress in this direction is S11. Likewise S22 is perpendicular to the line on the plane of the SCL. S33 is perpendicular to the line out of plane. S12 is the shear stress in the plane of study. For 2D axisymmetric studies S13 and S23 are zero. The correct SCL components must be included to get the correct membrane and membrane + bending results in the SCL. 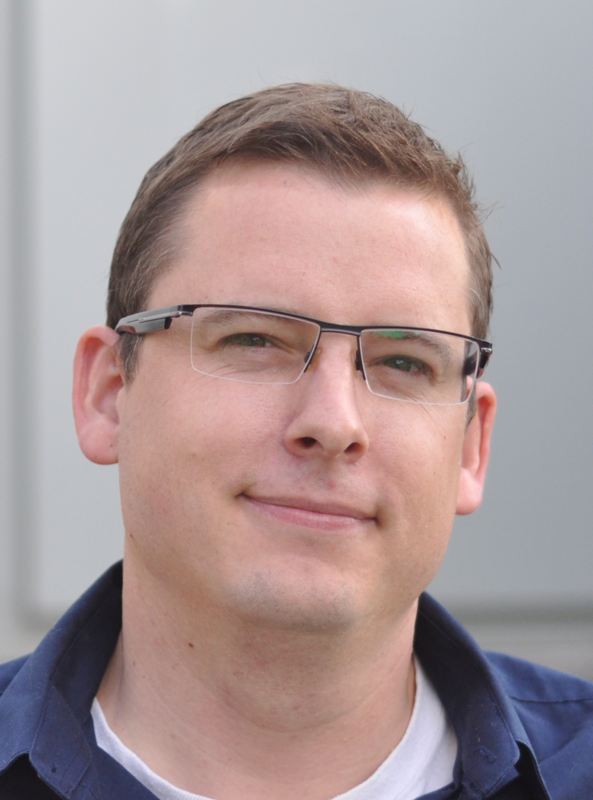 The default settings in most SCL tools will not work for pressure vessel studies. 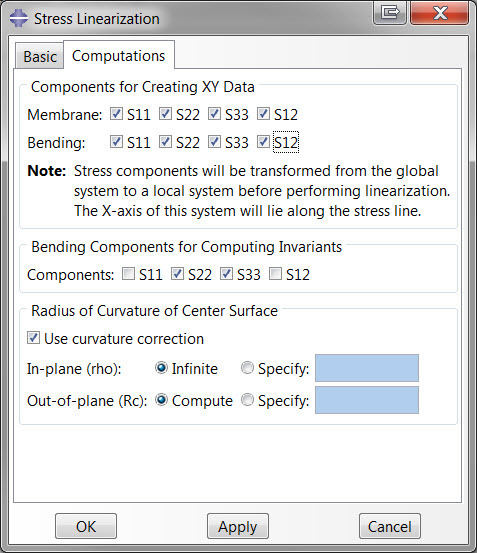 The ABAQUS tool must be configured to include S11, S22, S33 and S12 (all the available data) in the membrane stress calculation. Here we have also included the same S11, S22, S33 and S12 components in the bending calculation – however the bending result has no defined meaning in pressure vessel studies and is ignored. The “Bending Components for Computing Invariants” is the calculation of the averaged difference in stress from one end of the line to the other. Only bending components are included in the invariant calculation. 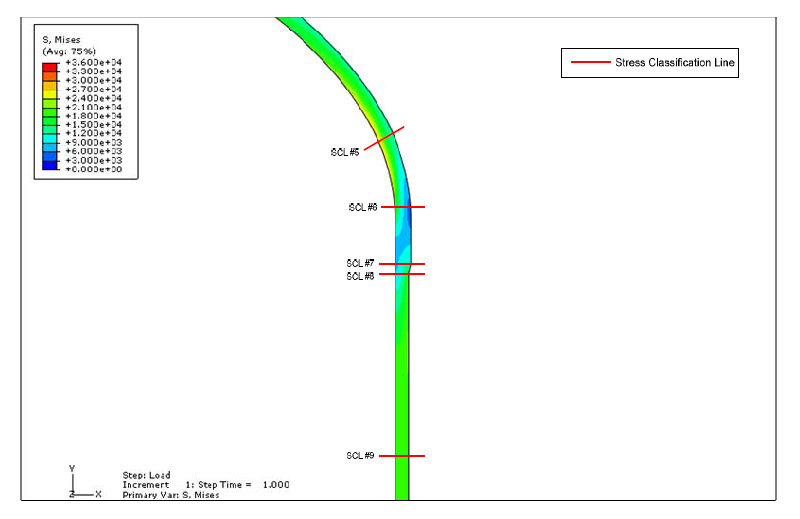 For this 2D study stresses S11 in the direction of the SCL and shear stress S12 are not perpendicular to the SCL and can not create a stress bending the SCL. Stresses S11 and S12 are removed from the invariants. 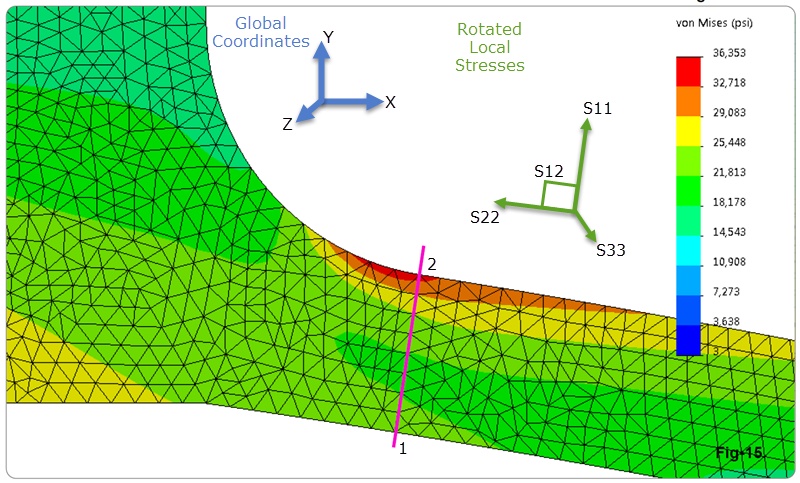 Going beyond this PTB-3 example, a 3D FEA study will have data points with 6 stress components: S11, S22, S33 and S12 as discussed above, with the addition of S13 and S23 (shear components not shown in the above diagram). Of these two new components, S23 produces a torsion of the SCL and is included. S13 is not perpendicular and is removed. PTB-3 does not discuss convergence of results or quality of the mesh. We used the Error plot built into SWS to determine if the model is adequately converged at the mesh size used. Acceptable mesh errors in non discontinuity zones is 5%. Discontinuity areas often have higher errors. For this model the error is less than 1% except at SCL 1 at the base of the flange to nozzle weld discontinuity where it is an acceptable 5%. ABAQUS does not have an error plot so it was only run in SWS. We obtained displacement and stress plots from both SWS and ABAQUS that closely match the results published in PTB-3. A comparison of our SCL results from SWS and ABAQUS vs PTB-3 is presented in Table 1. Our results matched PTB-3 within 4% of full scale stresses. Given the assumptions we had to make in modelling this comparison, we consider this to be extremely good results. Our SWS results matched our ABAQUS results within 0.4%. We split the model at the SCL locations to remove sampling location errors between the two programs. Even so, we did not expect results this close, as this ABAQUS analysis is based on 4 sided elements with 8 nodes while SWS is based on 3 sided elements with 6 nodes. However, the model is highly converged as shown in the SWS error plot so the closeness of the results should not have been surprising. We use SolidWorks Simulation and ABAQUS for a variety of design tasks in our office. The programs have different characteristics that lead them to be suitable for different applications. SWS is a much easier to use program, usually resulting in finished results in half the time, however it does not have built in linearization results that are compatible with ASME methods. We wrote our own tool to get around this shortcoming. ABAQUS allows a lot of control over the generated mesh vs SWS. This extra control also requires more effort. The ABAQUS quadralateral mesh is expected to be more accurate than the SWS triangular mesh, but for this overrefined example, the difference turned out to be negligible. ABAQUS has the better results plots where screen updates happen much faster than SWS’s. And for non-linear analysis, ABAQUS provides results more often and is more stable than SWS. Downloads the two reports for this validation exercise: ABAQUS and SolidWorks Simulation.